Are you a Publisher, Agent or Publicist? Are you a School, Library or Charity? Are You Being Set Up To Fail? Read reviews and win free books each month. Free books for your school, library or charity. Share your opinions to help authors and readers. This author has not entered their information for this social networking page. If you are the author, please login to your Author Area where you can update all of your links and other information. This author participates in our Review Exchange and Book Donation Program. Click here to learn more. This author participates in the Readers' Favorite Book Review Exchange Program, which is open to all authors and is completely free. Simply put, you agree to provide an honest review an author's book in exchange for the author doing the same for you. What sites your reviews are posted on (B&N, Amazon, etc.) and whether you send digital (eBook, PDF, Word, etc.) or hard copies of your books to each other for review is up to you. To begin, click the purple email icon to send this author a private email, and be sure to describe your book or include a link to your Readers' Favorite review page or Amazon page. This author participates in the Readers' Favorite Book Donation Program, which was created to help nonprofit and charitable organizations (schools, libraries, convalescent homes, soldier donation programs, etc.) by providing them with free books and to help authors garner more exposure for their work. This author is willing to donate free copies of their book in exchange for reviews (if circumstances allow) and the knowledge that their book is being read and enjoyed. To begin, click the purple email icon to send this author a private email. Be sure to tell the author who you are, what organization you are with, how many books you need, how they will be used, and the number of reviews, if any, you would be able to provide. 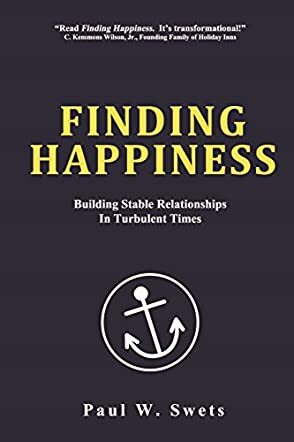 Finding Happiness: Building Stable Relationships in Turbulent Times by Paul W. Swets is a helpful and useful guide to all those who are in search of happiness and want to build good friendships and live an enriching and fulfilling life. Life is worth celebrating and the author helps everyone to connect properly with the people around them, develop a depth and purpose to their living, and shows how to live their today without being anxious and scared of their tomorrow. Filled with wisdom, wit, insights, tips, and techniques, this book is definitely a must-read for all those who want to create good experiences in their lives. I found the book insightful, profound, and uplifting. The approach to the topic is simple and fresh, and that makes it easy for readers to incorporate the author's suggestions into their daily living. It's a book for all those who are looking to improve themselves and their relationships with others, and will see them in happier positions and with better friendships soon. The author's words are encouraging and will inspire and motivate readers to change their outlook towards life and the things around them, and will pave the way for a meaningful and happy existence. The book is good for counselors, educators, and therapists as they can use it for giving proper guidance to those who need it. It's a great read and has excellent tips to make one a better communicator, and also a better and happier human being.